Veneer process at Sugar Fix Dental Loft! As we approach the New Year, we have had several guests come in to see what they can do to improve their smile. We always encourage anyone who is thinking about it to come in and see what the veneer process is like and see what their smile will look like at the end of it all! What will my temporaries look like? These are all fabulous questions, and we are going to fill you in now! 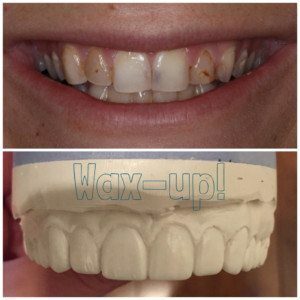 The process for a veneer case start to finish is one month. Your first appointment is a consultation with Dr. Emery to evaluate your teeth and smile. You will then decide how many teeth you would like done and we can start that day with the diagnostic cast impressions to send to our amazing and high-esthetic lab, Aurum. The lab then takes the models of your teeth and enhances them to ideal golden proportion (the perfect smile!). Patient before, and patient wax-up made by lab! Lab matrix to make temps! A matrix is then made from this model and then Dr. Emery transfers the design onto the teeth. This way, while you are in temporaries, you will have a “trial smile” of what your final veneers will look like. We are able to make your temporaries two weeks after your initial visit. At this visit, Dr. Emery prepares the teeth for the veneers. We always give our patients Advil and will give you as much anesthetic as you need. There will be no discomfort during the procedure. After the procedure, as with any dental procedure, there is slight soreness or slight temperature discomfort, but nothing that Advil can’t help! While in your temporaries, the lab makes your final porcelain veneers and those are “seated” or two weeks after the temporaries are placed. 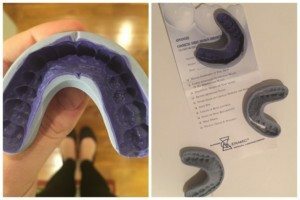 We always recommend that a night guard is made after any cosmetic treatment is done. This takes an additional two weeks from seating the veneers; but your perfect smile will be in place! We hope this answers most of your questions about the veneer process, check out our gallery here, and please call us if anything else comes to mind and we would love to set up an appointment with you!